I am a Nokia user since I had my very phone back in the late 90's and I can attest to the durability of their phones. My 1st phone is the 3210 that is so heavy and bulky to bring but mind you even If I dropped it several times, it is has worked fine but I had to give it up since more models have sprouted over the years. The Nokia I am using right now was given by my bro-inlaw from Australia , he gave it to me when he replaced his with the N-series. It was given to me in 2006 and I am still using it eventhough it has no camera and other features as well. Anyway, new phone models come every now and then that makes consumers more baffled on what to buy. Techies went gaga over the Mac's iPhone where only few can actually buy bec. of the price. 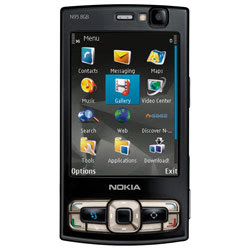 I think I will have to settle with Nokia N95 8GB Smart unlocked phone as it also some features that will match my cellphone needs.